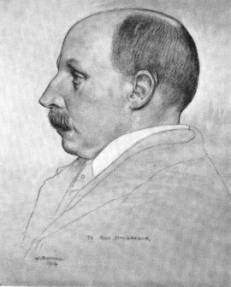 William York Macgregor was born at Finnart in Dunbartonshire on 14th October 1855. He was the third son of John Macgregor of Finnart, and by his second wife Margaret York. John Macgregor was a shipbuilder and partner in the firm “Tod and Macgregor”, but died on 23rd September 1858 when WY was less than three years old. He had studied at Western Academy in Glasgow with James Paterson (1854–1932), who knew him as “Puffy” or “Gigi”. These two young men then went on to the Glasgow School of Art, studying under Robert Greenless RSW (1829-1896). They painted together from 1877 at St. Andrews, Stonehaven and Nairn, practising a form of plein-air painting. During this period WY was a pupil of James Docharty (1829–78). In 1877 and no doubt as a deliberate rebuff, the Glasgow Art Club rejected membership applications from WY and James Paterson. These applications were serious ones from professionally trained artists. Also rejected were the younger James Guthrie and E.A.Walton. WY and Paterson responded by leaving Glasgow. WY trained at the Slade School of Fine Art in London under Alphonse Legros. Paterson Went to Paris and studied under Jacquesson de la Chevreuse and later Jean-Paul Laurens. Guthrie also spent some time in Paris but with Walton and their friend Joseph Crawhall, spent summers painting in various small towns, mostly on the east coast of Scotland. After finishing his studies at the Slade, WY returned to Glasgow and lived at 134 Bath Street. Thus started the growth of what was to become an influential group of painters in Scotland. WY is usually regarded as “The Father of the School”. His slight superiority in age, combined with his training and financial independence made him a natural leader for the younger painters in the group. They shared models and materials and discussed the new ideas of the young French painter Jules Bastien-Lepage, whose naturalist “plein-air” painting attracted them. The "Boys" came to WY’s studio not only for discussion but for instruction as well. James Gutherie and Arthur Melville appear to be the only Glasgow Boys not to have attended these classes, relying on the summer painting excursions to continue their contacts with the other "Boys". A sample of WY’s advice is remembered as ‘hack the subject out as you would were you using an axe, and try to realise it; get its bigness. Don’t follow any school, there are no schools in Art’. In criticising work he was ‘damningly just’. Painting was always a serious task for WY. In the 1881 census he was found at 3 Park Street West, Glasgow, also living there were his mother Margaret York Macgregor, his half-sister Janet and his cousin William Yorke. 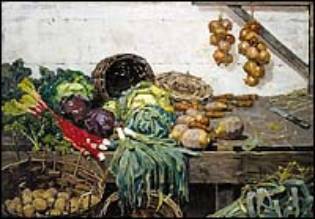 In the winter of 1882–3, however, he began work on a large painting directly inspired by Bastien-Lepage, showing a girl selling vegetables from a stall. The artist removed the life-size figure in 1884, probably after seeing the figure paintings produced by Guthrie at Cockburnspath in 1883–4. This altered picture, the Vegetable Stall (Edinburgh, N.G. ), remains one of the most important realist paintings produced in Scotland in the 1880s. Macgregor’s other naturalist paintings reflect Guthrie’s use of direct sunlight but demonstrate Macgregor’s weakness as a figure painter. This is notable in the Cottage Garden, Crail (1883) and Crail (1883; Stirling, Smith Art Gallery & Museum). After 1885, WY began to withdraw from Glasgow as he suffered from severe asthma and moved to Allen Bank, Bridge of Allan to convalesce. He spent two winters in the south of England, probably with his brother Peter Macgregor, who lived in Worthing. He also lived in South Africa from 1888 to 1890. During this time Guthrie gradually became adopted as leader of the Glasgow Boys. His health improved in South Africa to be replaced by homesickness. He returned to Bridge of Allan but remained on the fringes of the Glasgow school during the 1890s. In 1898 he was elected to the Royal Scottish Academy. His landscapes were never popular with collectors but remained bold in colour and handling. At the time of the 1891 & 1901 censuses he was living at Albyn Lodge, Bridge of Allen with his mother Margaret York and half-sister Janet Macgregor, known as Jenny. In this year his brother Peter Macgregor died and WY, Janet and James York (their uncle) became responsible for his three young boys, as executors of Peter’s will. He married Jessie Watson (born at Clonesbank, Buittle, Kirkcudbrightshire on the 13th June 1879 to gamekeeper Robert and Sarah McBride) on the 30th April 1923 but died soon after at Oban on the 28th September. He is buried at Logie Old Church near Bridge of Allen along side his half-sister Jenny. His wife was buried there after she died on the 24th November 1941. The church can be found about 200 yards past the existing Logie Church on Sheriffmuir Road. Thanks to www.artnet.com, Roger Billcliffe and William Buchanan for providing some of the background to this article.